Here are the logs I sent out while we were in the Marquesas Islands. Friday night just before dark, while anchored in Baie Tahauku (the bay by the town Atuona), I went out to check our anchor lines. I discovered that the stern line had snagged on the rudder. Despite repeated attempts to free it with a boat hook, we were unable to unsnag it before things got pitch black. With it snagged, if our main anchor dragged, we would be unable to maneuver under either power or sail. So, I got an extra anchor ready, then went to bed, hoping for the best. In the morning, CJ dove on it, but was still unable to free it. He finally ended up cutting the line. We finally had enough of Atuona and its crowded anchorage, full of surge. We decided to move over to Baie Hanamoenoa on the nearby island Tahuata, which has a reputation as a much more hospitable anchorage. We had a beautiful sail over and ended up anchoring in 50' of water in a stunning setting. Hanamoenoa is beautiful, relatively calm, and much drier. It truly looks, feels, and smells like the tropical paradise of your dreams. 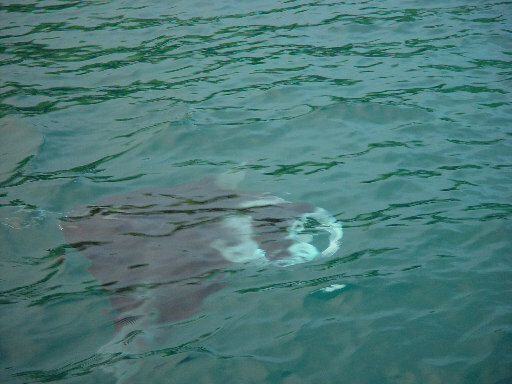 We spent about an hour standing on the deck watching about 20 giant (maybe 8' "wingspan") manta rays swimming slowly along the surface of the ocean, feeding, with a setting sun in the background. Gorgeous! There about 20 boats in this anchorage --- perhaps 10% of all the boats that come through this way! But, everyone is very cool, very helpful. We spent the next day (today), snorkeling and (finally!) drying out the boat. Everything was damp and beginning to mildew from two weeks of wet, wet, wet, with very little sunshine. Hanamoenoa is on the eastern side of the island, so there is enough of a rainshadow to have sun, sun, sun! We festooned the lifelines with towels, the decks with cushions, and opened up all the lockers and drawers to dry out. I was also able to rinse off the carpets and sole, still damp from salt water from the storm now two weeks ago. In our casual chit-chat with other cruisers, we have run across many other boats that got hammered by the 19 April storm. We fared much better than most, despite encountering the same conditions. I think this is probably because CATS PAW has very little windage with nothing on our decks and no arch and, loaded as she was, she was still well within her design weight. The boats having trouble tended to have a lot of "crap on zee back" and were loaded to the gills. We will go back to Atuona tomorrow to send Charlie and Craig off on the 4th, do a bunch of boat chores including laundry, and then pick up Lee on the 6th!!! Yesterday, we left the anchorage where we have been the last couple of days and sailed back to Atuona. For variety, we took the long way, circumnavigating the island, Tahuata, that the anchorage is on. It's a much smaller island than Hiva Oa --- it was about 30 miles all the way around. It's a spectacular island with very steep cliffs and volcanic spires studding its southern side. This afternoon, after over a month together, we saw Charlie and Craig off to the airport. The boat seems empty without them now! Chris and I decided to walk into town to see if he could get some medical attention for water he has had in his ear for over a week. What we got was a wonderful lesson on the benefits of socialized medicine. We had heard that the clinic was "behind the Mayor's office" so we wandered down there, unable to see any building that looked remotely like a clinic. I guess we had expectations of a crammed waiting room, full of squalid babies and smelling of disinfectant. What we found instead was a modest, long cinder block building with no reception area, just a row of doctor's offices. Unable to find anyone to help us, we just picked one at random and went in. The young doctor there was doing nothing so he immediately started to examine CJ's ears. Five minutes later, we walked out with ampoules for dissolving ear wax, syringes, and an ear antibiotic, all for free. It was all amazingly low key and easy. It made you realize how complicated the American system has made the 95% of the medical cases it tries to treat. On the way back, we decided to try to find some fruit for sale. Last week we had seen a sign "Fresh Fruit" at the entrance to a field, but the road was awash in muddy water and the field looked more like a swamp. Today, it was still mighty wet and swampy in there, but we persevered, wandering amongst the avocados and guava, looking for someone to help us. We stumbled across the owner's house tucked in amongst the trees, surrounded by derelict cars, trucks and other stuff. "House" is generous --- it was really nothing more than a tar paper roof. A woman was resting underneath, but when she heard us, she immediately got up to help. She turned out to be a charming person with whom we wandered amongst the trees, looking for just the right pamplemousses for us. We ended up getting four giant fruits, and she threw in a dozen guavas and two fruits that I can't identify, all for $4. Two great experiences in one day! And, it didn't rain once. Lee finally flew in on Thursday. Unfortunately, it wasn't without its dramas. I hitched out to the airport at 11am for her 2:30pm flight. I got a ride from the Air Tahiti mechanic who told me that the plane had "mange une oiseaux." Now, it's been 30 years since I took college French, but I was pretty sure he said that the plane had "eaten a bird!" As it turned out, he was helicoptering over to Nuka Hiva to either fix it, or get another plane ready. I knew it was going to be a long wait. At about 5pm, a rather unhelpful Air Tahiti agent told us that the flight had been cancelled, that she had never heard of Lee, and had no record of her ever having been on the flight. So I reluctantly headed back to the boat, having no idea where Lee was. I met CJ at the docks and we stood around in the dark, unsure of what to do, when who drives up, but Lee! The flight came in after all, just at dark, and she managed to bum a ride into town from one of the local hotels. Man, it was great to see her after a month apart!! Baie de Vierges on Fatu Hiva, Marquesas. This bay used to be called "Baie de Verges" or "Bay of Penises" for obvious reasons. We spent another two nights at Atuona before we finally got away, heading to Fatu Hiva, an island made (relatively) famous by Thor Heyerdahl's novel of the same name. It is the "least spoiled" of the Marquesas Islands (none of them are really "spoiled!") because it does not have an airstrip. Life is still slow and if you can look past the many satellite dishes, relatively traditional. Our first day here we hiked up to a local 300' waterfall, hoping to swim in the pool underneath. It's an hour and a half hike with a bit of bushwacking. The waterfall was spectacular, but with all the rain we have had, it was a gushing torrent, pounding on the rocks below --- it didn't make you want to get underneath! So, we enjoyed the views for an hour or so, then headed back through the rain. When we got back near town we were befriended by a young woman who was determined to sell us four green oranges for either $5, or the gold necklace that Lee was wearing. Every time we come into town she gives it another attempt with renewed energy, but despite my attempts to get a better deal, or at least some ripe oranges, she says "Non!" Well, we'll keep at it! I admire her entrepreneurship. Today we hiked up over a ridge to get a better view of the caldera in which the town (Hanavave) sits. Wow! The mountains here are incredibly steep. Lee and the "Banana Vang". The "regime" of bananas was given to us by friends Sam and Peter on Lillian B. The town has about 600 people, living in modest houses surrounded by neat gardens and lawns. I have no idea what they all do for a living --- it's hard to imagine the half dozen copra sheds could support all these people --- but they are obviously well off and healthy. There are only a handful of cars. Its quiet, confident style is greatly appealing and we are enjoying our stay here. Tomorrow we head back to the dreaded Tahuka Bay for one last visit in order to checkout with the local gendarme. Then we head over to Nuka Hiva. We've decided to try for the Tuomotus while CJ is still on board so he gets a chance to see them, so we will only spend a few days at Nuka Hiva before moving on. A big objective is to get some more diesel there, as we are still running on our original San Diego tank and they still are not selling any at Atuona to cruisers. After a dawn start from Hanavave, we headed back to Atuona and the anchorage from hell, in order to check back out of the southern Marquesas. 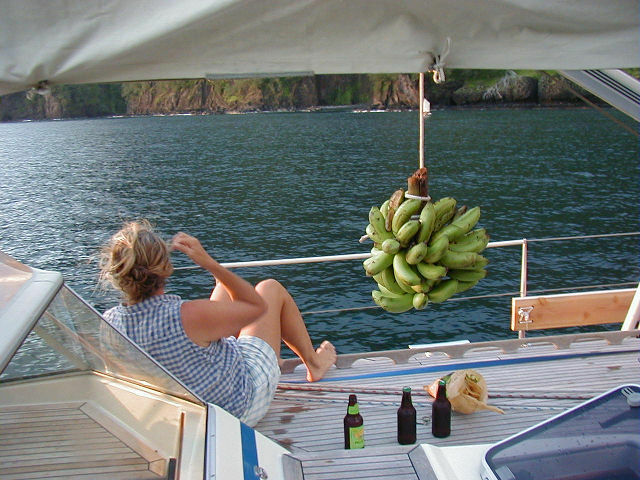 As we sailed on, the idea of going back there was less and less appealing until, before I knew it, I pared off 20 degrees from the autopilot, and started heading back to Tahuata Island and the wonderful anchorage at Baie Hanamoenoa. I don't know how we'll check out of Atuona, but we'll figure something out. For now, we're happy. We arrived around 3pm and immediately went snorkeling. The scene this time is quite different. There are only 3 other boats here, instead of the nearly 20 boats we encountered the first time. It seems that we have dawdled long enough in the southern Marquesas that we are now after the big bolus of boats that arrived at the end of April. 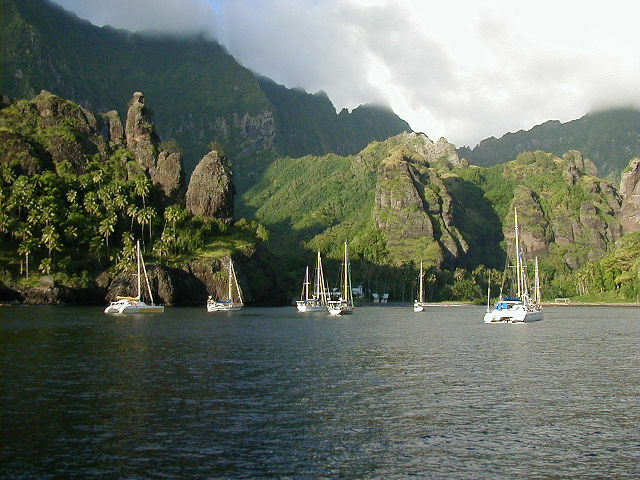 Most boats have moved on to Nuka Hiva, the Tuomotus, and other parts beyond, leaving some choice anchorages to us. We took the dinghy out to go snorkeling, anchoring it with our grappling hook. Unfortunately, when it came time to leave, the hook had snagged on a big head of coral 30 feet down. No amount of tugging and maneuvering would clear it. I didn't relish the thought of free diving 30' to release it, so we decided to go back to the boat and get a hunk of chain to run down the anchor rode and attempt to free it that way. I don't have any little pieces of chain, just 40' sections of 3/8" BBB that weigh about 50 pounds. But, we did our best. At one point, CJ and I were floating around in the dinghy, leaning over the side with masks in the water, playing with all these pieces of line and heavy chain running over the side, trying to free the anchor. I felt like we were playing with marionettes. CJ started to laugh at the absurdity of it and got me laughing. That only slowed us down and we had to sober up, lest we lose everything over the side. We finally maneuvered the chain at an angle to the anchor where we were able to slide the latter sideways and free. Done! On the way back we met STARBURST, out of Portland, Oregon. I managed to fix their PACTOR modem problem. We promised to get together in the morning. Dinner of Pad Thai and Tabouli. We had a wonderful two night visit to Tahuata Island, then decided to leave for Hakahau Harbor on the island of Oa Poa, one of the smaller, inhabited Marquesan islands. Because it's a 65 mile sail, and because we didn't want to arrive in a strange anchorage after dark, we started at 3:30am. What a wonderful night and dawn it was! Warm and balmy, full of stars, and a sliver of a moon. Our passage was reasonably quick, but ironically we were slowed down a bit by needing to go dead downwind, the slowest point of sail for Cats Paw, necessitating a couple of gybes to keep the boat speed up. We arrived at about 4pm, with plenty of time to put out bow and stern anchors before dark. Cats Paw at anchor in Hakahau Harbor, with the spectacular skyline of Oa Poa behind. Oa Poa has a spectacular skyline. From our boat we could see sheer 1000' cliffs, tall spires, and jagged running ridges. It is one of the most beautiful natural harbors I have ever seen. Unfortunately, it was marred by the siting of the town's generator: right on shore, and its sound filled the harbor. From our boat we were able to watch an informal outrigger race between some of the local youths. There were about 25 of them. They started out by running around the harbor, out the breakwater, and then jumping into the water, to swim back to shore. Then they jumped into the outriggers and full of shouting and enthusiasm, pulled their way our of the harbor and around some buoys in the outer bay. They did five laps, every time exchanging crews by the breakwater. The old crew would leap over the side, and the new would clamber over the gunwales and lean into their paddles, renewed with energy. It was certainly physical education! They kept this up for over an hour before a winner was declared! The next day (yesterday) we started out full of ambition and energy and decided to hike 5km to an archaeological ruin that we had heard about. But by 9am the heat and humidity had humbled us and we were dragging! We took a wrong turn and found ourselves by the town garbage dump, then a gravel mine. By this time, stupefied by the heat and the less than inspiring surroundings, we headed back to the boat. Later, we learned that the "real site," that is the one that had been excavated, was more like 15km away. The one we had heard about was overgrown by vegetation and there really wasn't much to see. We had to check in with the local gendarme in Oa Poa. There could not have been a bigger contrast between the laid back attitude of the Marquesan bureaucrats and the up-tight, paranoid American agents. We had left Lee's passport on the boat, and didn't even have her passport number. The gendarme said "No problem! Give me your bank account number instead." This morning we left Hakahau Harbor, bound for Baie D'Anaho on the island of Nuka Hiva. 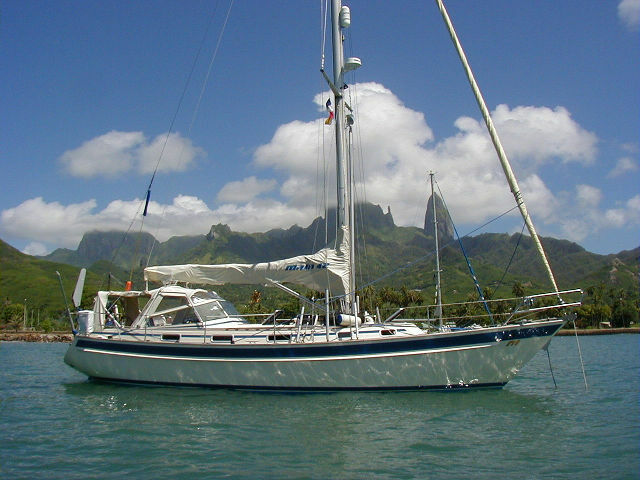 We had heard that this bay offered "the best anchorage in the Marquesas," meaning that there was very little swell and good holding, as well as a nearby coral reef. The winds were perfect, a beam reach in 15-20 knots, so we cruised along at over 7 knots, covering the 40 miles in about 6 hours. When we got there, there was a surprising number of boats --- about ten --- so we didn't get one of the choice, minimum swell spots, but it's still calmer than a lot of anchorages we've been in recently. We'll stay here for a couple days, enjoying the snorkeling, then head over to Taiehoe, the main town in the Marquesas to check out and to (finally!) take on some diesel fuel. This morning we pulled anchor and left for the Tuomotus, about 450nm away. Fresh fruit and vegetables are extremely hard to find in the Marquesas (even harder in the Tuomotus), so before we left, we made a point of visiting the veggie lady, who sets up shop three times a week at 8am in Taiohae. She is about the only reliable source of vegetables in something other than a can that we have found in all of the Marquesas! The sight of fresh lettuce, cucumbers, eggplant, and bok choy was enough to send us into heights of delirium! Fresh salad for dinner tonight! As we sailed out of Nuka Hiva, we passed the bay popularly known as "Daniel's Bay," named after an aging local who has made his bay one of the most cruiser friendly spots in the world. This fellow has gone so far as to plumb a freshwater spigot on a float in the middle of the bay! Unfortunately, two years ago, the TV show "Survivor" decided that of all the spots in the world, Daniel's Bay was where they wanted to film one of their dramas, so they invited Daniel to move and built him a new home elsewhere. I haven't heard from any boats this year whether Daniel's Bay is still as cruiser friendly. A picture of Cats Paw bound for the Tuomotus, taken from our good friends Sam and Peter's boat Lillian B. While three people on board is still one more person than most cruisers have out here, it's 1/3 more work than when we had four! We have to do a total of 8 hours of watches in each 24, instead of the very luxurious 6 when Craig and Charlie were on board. We have a complicated watch schedule that limits a watch length to 3 hours during the night, and gets Lee to bed at a reasonable hour! We hope to arrive in Manihi, our destination in the Tuomotus, after a three night, four day passage, but more important is to arrive in good light. 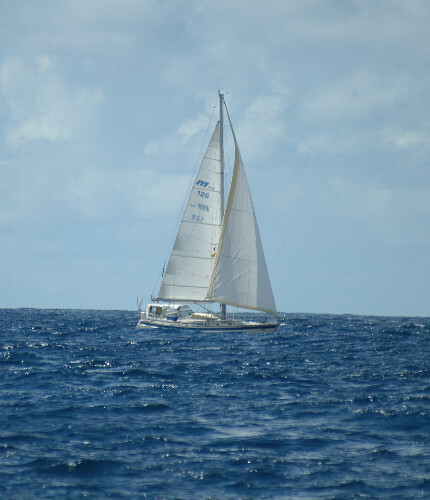 We may have to heave to offshore, waiting for the right conditions to enter Manihi's reef.